Have a great week and thanks a lot for reading! Sì mi piace questo trend, però non deve cadere nel pacchiano! Beh per me è un super sì, mi spiace solo non avere più i jeans fighissimi che avevo comprato una decina di anni fa! 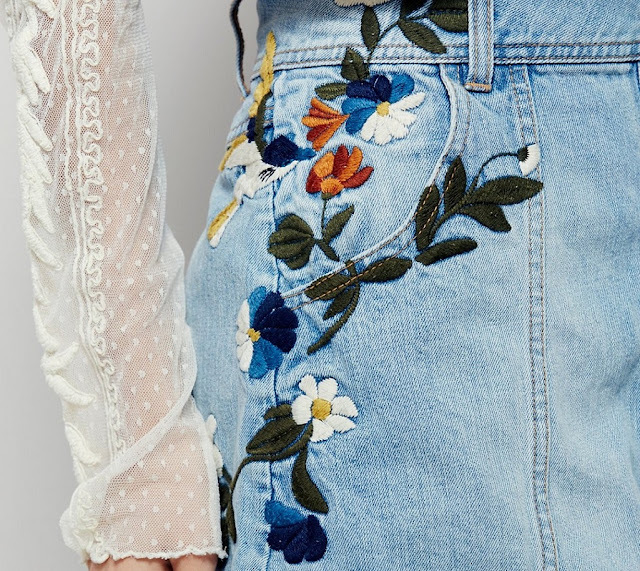 I really like the look of embroidered denim! It can be such a pretty detail and such a nice way to customize a denim look. Now I think I need to look for an embroidered denim piece. Happy new week Lilli! i love this trend. And i got an eye of a embroidered denim like this. 10 years ago i had a jeans with those flowers. Every trend will come back. I can´t wait to see your customizer Jeans. Have a fantastic week dear Friend. Una tendenza moda che mi piace ma che non vedo su di me. A me piacciono, ma non tutti. E soprattutto devono essere moderati. Ne ho visti alcuni oggi troppo, troppo ricamati. I have one pair embroidery jeans that I bought from H&M 10 years ago! LOL! And I'm so happy that this trend is back because I can wear it again. I think a pretty and feminine trend, I had clothes like this in past seasons, but now I do not have or dismiss this trend! Happy start of week Lilli. I like the embroidery on Denim. It is so chic and cool.